Las Vegas has been great great great. The revamped Sahara is marvelous, and just like always--dry martinis everywhere. It's a good gimmick I guess. You know, no matter how many times I come out here to work, I'm stunned by the lights as the plane lands. Even in the daytime. I hope you can make it with me next time. I really miss being side by side with you at the slots, babe. How are you feeling? Attendance has been a little thin the past week and I can't figure out why. I haven't been outside for days, there's just so much to do. I was getting a little restless after the show and decided to cash in on my comped drink. Would you believe it? No Handleman's Sherry! Not the Dry or the Secco!! Well, I settled for a Gimlet and sat down at one of the blackjack tables. This guy sat down at the table right in the middle of a deal. The dealer told him he'd have to wait for the next one, and he told the guy, "I'm the dealer! Gimme the cards!" (This guy sounds like a real card, huh?) Everyone at the table was ignoring him, but he kept telling the dealer to hit him. 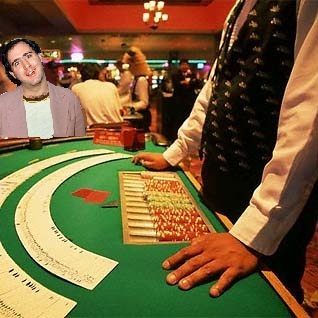 The dealer had to remind him he hadn't been dealt in. 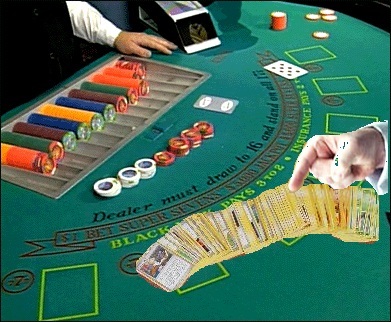 Then he said, "I'm the dealer! I'm the dealer!" Security came over and told him to keep it down. So this nutcase finally shuts up, but pulls out some deck of cards with cartoons all over it and keeps saying he won. That's when their argument started and he finally left the table in a huff. Well, after 7 or 8 Gimlets, I was a little tipsy-ripsy and had lost enough money. I was walking back to my room and a fan stopped me. He was telling me how he loved me in Gilligan's Island. I told him I never was, or if I was, I must have had a really good time because I didn't remember. Once he started screaming at me, I knew it was the same guy from the table-- "I'm the Professor! I'm the Professor!" He had a shovel, or a spade (I didn't know what to call it!) and he told me to come with him, but I passed. I said, if that guy was on Gilligan's Island he would've been a coconut! I was making it back to my room when someone almost knocked me over. 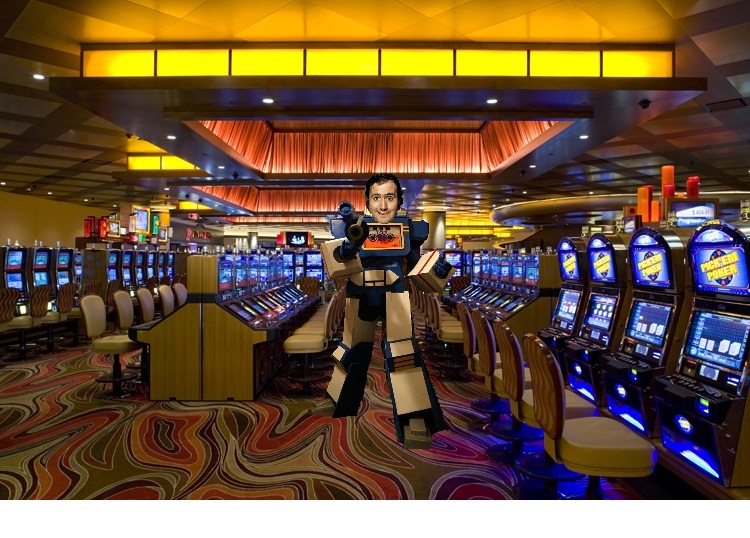 It was the same guy, "I'm a slot machine! I'm a slot machine!" Mercy mercy mercy, he was running from the security, surprise surprise. I decided that either those Gimlets were really good or this was a scene I didn't want to be a part of. I went to the penthouse and crashed, watching that God awful Jimmy Blacneh movie... for about the fiftieth time! Like I said, Las Vegas the dear starlet she is never fails to surprise me after all this time. I was thinking about what you said about my stories and you're right. I should probably do a one-man show someday. Of course I'll want you in the front row. I miss you dearly, darling. This guy sat down at the table right in the middle of a deal. "I'm the dealer! Gimme the cards!" It was the same guy, "I'm a slot machine! 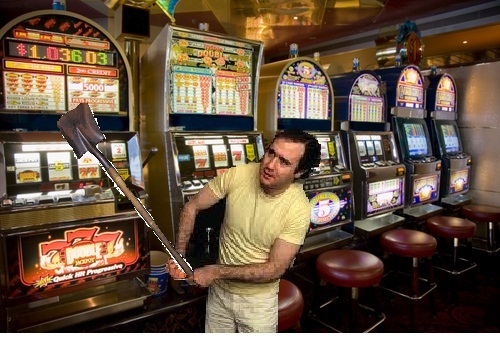 I'm a slot machine!"